Hooray, it's Wednesday again! And time for Week 2 of GBBO! Last week on Great British Bake Off they made lots of boozy cakes, and we made a double boozy raspberry and almond madeira cake. This week it's BISCUIT WEEK! So naturally I'm making boozy biscuits to nibble while I watch the bakers attempt their biscotti and all kinds of other treats. 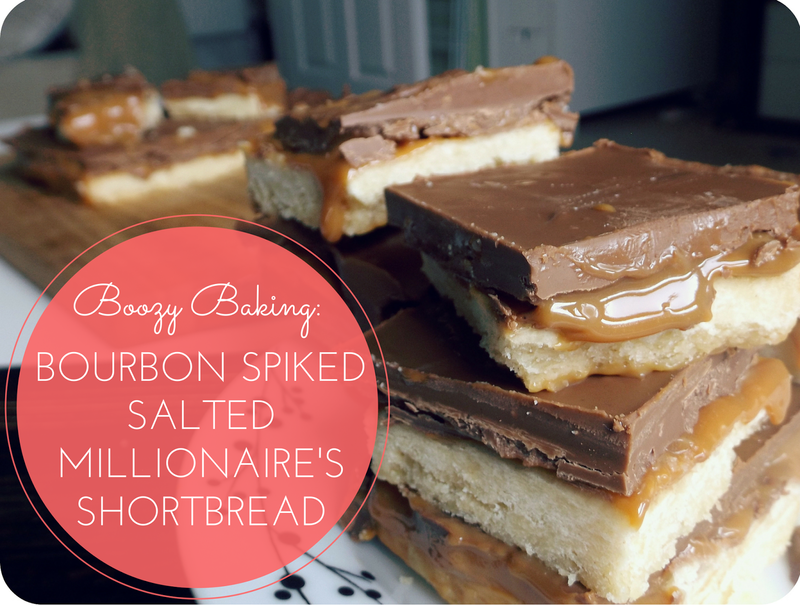 I was going to make a sort of 'alfajores' type caramel cookie sandwich and dip it in chocolate, but then I realised that's basically millionaire's shortbread but with lots more effort! And I'm so very lazy. And I suspect, on a Wednesday evening, you're feeling pretty lazy too. It's still technically a biscuit, too, just with lots of tasty toppings. Confession: Yes, I totally cheated on the caramel and bought the Carnation stuff out of a tin. 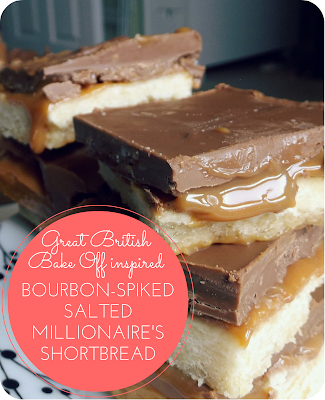 You can make your own if you want - there's loads of recipes out there that teach you how, like this Mary Berry millionaire's shortbread recipe (hers doesn't have salt or BOOZE in it though). 1. Sieve the icing sugar and flour together in a bowl. 2. Add the butter and rub it through the mixture until it's all combined. This is very sticky and usually takes a good five minutes. 4. While you wait, preheat the oven to 150 degrees, grease a square tin with butter and then line the tin with greaseproof paper. 5. Remove the mixture from the fridge and press it firmly into the tin, giving it a good knead with your knuckles to make sure it's level and well pressed into the corners. 6. Pop it in the oven for 30-35 minutes, or until it's a light golden colour. Remove from the oven and leave to cool and firm up. 7. While you wait, empty the carnation caramel into a bowl and stir through the bourbon and sea salt. Taste to make sure it's salty enough for you. Then taste again, because it's fun. 8. Once the biscuit base is cool, spread the caramel mixture on the top. 9. Melt some chocolate, either by zapping it in the microwave for a minute or two or heating it in a bowl over a saucepan of water on the stove. Stir through sea salt - as much as you prefer. If you want a REALLY boozy hit, add bourbon to the chocolate as well. 10. Pour the chocolate over the top of the caramel, making sure its spread to all four corners of the tray, and then leave it to cool. 11. Once cool and the chocolate is firm, you can pull your completed millionaire's shortbread out of the tin and cut it into squares. Scoff the lot while watching GBBO, if you ask me.